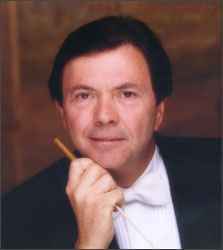 The American conductor and trumpeter Gerard Schwarz was born on August 19, 1947 in Weehawken, New Jersey. Schwarz began his musical career as a trumpeter. He auditioned for the American Brass Quintet and toured Europe and Asia, and remained with them until 1973. In 1973 Schwarz joined the New York Philharmonic Orchestra and became co-principal trumpet until 1977. In 1975 he had his orchestral conducting debut. In 1977 Schwarz co-founded the New York Chamber Symphony and served as their music director until 2002. He also succeeded Sir Neville Marriner as music director of the Los Angeles Chamber Orchestra, a position he held until 1985. Schwarz joined Lincoln Center's Mostly Mozart Festival in 1982 and served as their music director until 2001. He is now Conductor Emeritus of the Mostly Mozart Festival. In 1983 Schwarz joined the Seattle Symphony Orchestra as music advisor, and was invited to become their principal conductor in 1984. In 1985 he also accepted the role of music director, which he held until 2011. Schwarz has led orchestras throughout the world, including the Academy of St. Martin in the Fields, Berlin Radio Symphony, Ensemble Intercontemporain, the Hong Kong Philharmonic, the London Symphony, the Montreal Symphony, the Orchestre National de France, the Singapore Symphony, the Tokyo Philharmonic, and the Bruckner Orchestra Linz. In the United States he has led the Los Angeles Philharmonic, the Minnesota Orchestra, the National Symphony, the Oregon Symphony, the Philadelphia Orchestra, the Saint Louis Symphony and the San Francisco Symphony. From 2001 to 2006, Schwarz served as music director of the Royal Liverpool Philharmonic Orchestra. Schwarz is also known for his opera performances, and has appeared with the Juilliard Opera, the Kirov Opera, the Mostly Mozart Festival, the San Francisco Opera, the Seattle Opera, and the Washington National Opera. Since leaving the Seattle Symphony, Schwarz has served as music director and principal conductor of the Emmy-winning All-Star Orchestra, which features a handpicked ensemble of star players who come together annually for an eight-episode American Public Television series. In 2017 he published his memoir "Behind the Baton: An American Icon Talks Music".